Late last night, Lucasfilm and Disney announced Forces of Destiny, a new animated series/merchandise line focusing on the female heroes of the Star Wars galaxy. The idea of new stories with these characters was already fascinating, but now that we know even more about the series, we can’t wait until it arrives. The shorts with Rey will all actually take place within the runtime of The Force Awakens (to avoid revealing details from her past or The Last Jedi), exploring moments like her meeting with Teedo to rescue BB-8, or an off-screen encounter with a deadly nightwatcher worm on Jakku. One Princess Leia-focused short is actually inspired by an infamous Empire Strikes Back deleted scene, about a Wampa attack in Echo Base. The short, now set just before the events of the film, sees Leia rescue Chewbacca from a Wampa trapped in the base. Meanwhile, shorts focusing on the Star Wars Rebels heroes will not be set specifically within the show’s timeframe, but bridge the world of the shows with that of the movies. One short starring Sabine Wren, for example, will see her and Chopper exploring the Yavin 4 base from A New Hope, ahead of the Ghost crew making their way there in Rebels’ fourth season. 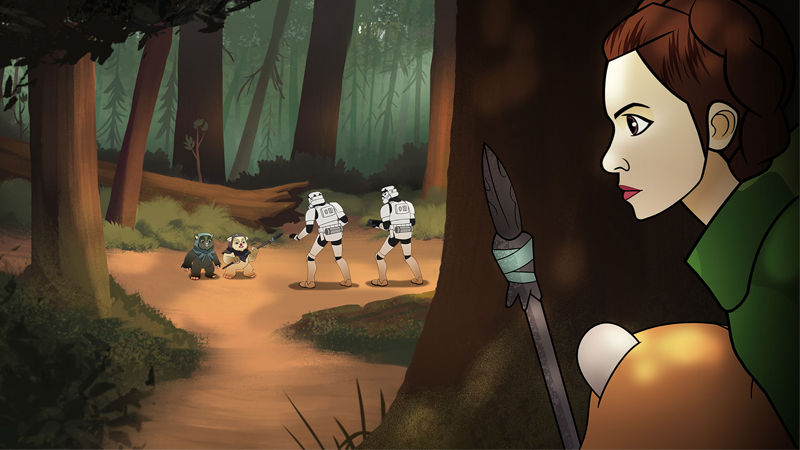 The most interesting of all, considering these are canonical tales, is one that will see Hera Syndulla from Rebels team up with Princess Leia and Han Solo on the forest moon of Endor, which seemingly pretty much guarantees that Hera sticks around for a while in the new Star Wars canon after Rebels and Rogue One. It’s great to see Lucasfilm trying to reach out and cater to new, younger audiences with shorts like these, but it seems like on top of all that, there’s going to be cool moments for longtime Star Wars fans to enjoy, too. The animated Forces of Destiny shorts are set to begin in July.